The Congressional Budget Office (CBO) just released its latest baseline projections – the first since last June and the first to incorporate the recent tax cuts and spending increases. CBO's baseline confirms our recent projections that permanent trillion-dollar deficits will soon return and that debt will continue to grow rapidly as a share of the economy. CBO's new projections are far worse than those produced in June 2017. Previously, CBO projected trillion-dollar deficits would return in 2022 and debt held by the public would total 91 percent of Gross Domestic Product ($25.5 trillion by 2027). Under CBO's latest current law projections, trillion-dollar deficits will return in 2020, just two years from now, and the debt will grow to 96 percent of GDP ($28.7 trillion) by 2028, the highest total since 1946. CBO's latest projections find that by 2025, current law deficits will total $1.5 trillion, or 5.1 percent of GDP. 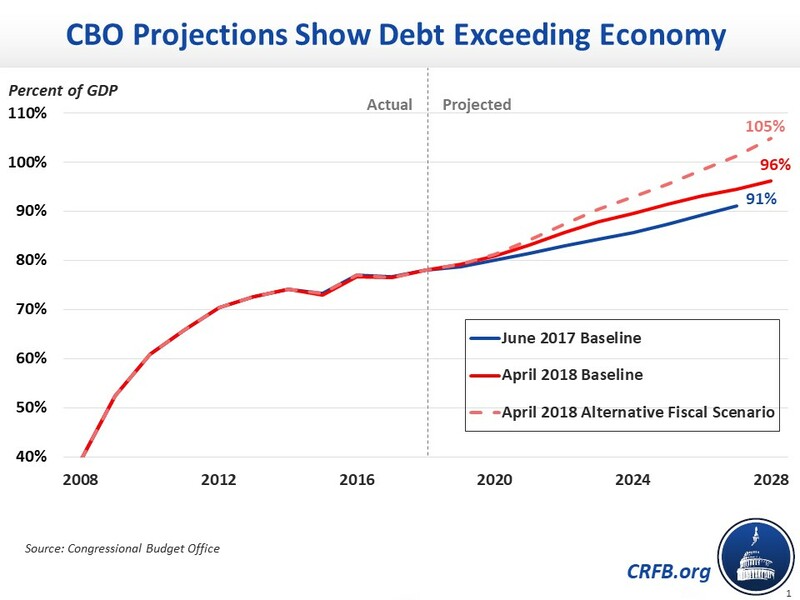 Even these gloomy debt projections will likely prove optimistic, since they are based on current law and thus assume the expiration of numerous tax provisions from the recent tax law and a $125 billion nominal discretionary spending drop in 2020. Under CBO's Alternative Fiscal Scenario, which assumes the extension of various tax and spending provisions, deficits would rise to $2.1 trillion (7.1 percent of GDP) by 2028 and debt would reach 105 percent of GDP ($31.2 trillion), the second-highest total in all of U.S. history. As mentioned earlier, CBO's newest projections are substantially worse than the already unsustainable fiscal situation they projected last June. They now project deficits will total $11.7 trillion between 2018 and 2027, $1.6 trillion higher than their previous estimate. Driving this difference is the effect of legislation passed since June 2017. CBO projects the tax cuts, spending bill, and other changes will increase ten-year deficits by $2.7 trillion, with $1.7 trillion coming from lower revenue and $1 trillion coming from higher spending. CBO also projects that the tax law will cost more than originally estimated but puts this revision in technical changes. Economic changes will reduce deficits by $1 trillion – nearly half of this a result of feedback from last year's tax bill. Specifically, CBO projects $1.1 trillion of higher revenue and $73 billion of higher spending due to economic changes. CBO projects the tax bill will increase GDP by 0.8 to 0.9 percent throughout most of the ten-year window, as the Joint Committee on Taxation (JCT) previously estimated, with the growth effect falling to around 0.5 percent after the individual tax cuts expire after 2025 (JCT had estimated it would fall below 0.2 percent). Finally, changes in technical assumptions reduce ten-year deficits by $57 billion, the net result of $492 billion of lower spending and $435 billion of lower revenue. The spending changes largely reflect lower health spending, while the revenue changes reflect lower expected individual and corporate income tax collections. CBO's latest budget projections show the mounting fiscal challenges facing the country. Deficits and debt are projected to rise rapidly as a share of the economy over the next decade, adding to an already high level of debt. Lawmakers have made the fiscal outlook significantly worse over the past year, and it's time to reverse course.